A silver honeycomb design washed with a delicious pale lavender color. 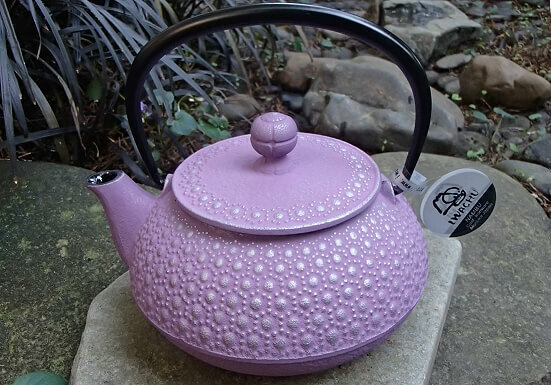 A beautiful birthday or iron anniversary gift!​ This cast iron teapot includes a fitted fine mesh tea strainer basket and a porcelain enamel coated interior. Certainly a memorable gift! Care instructions will be included with every Tetsubin. Make a statement with this heavily textured and cocoa brown Japanese iron teapot. The main focus is its unique cube shape and its generous capacity. Simple, yet striking. 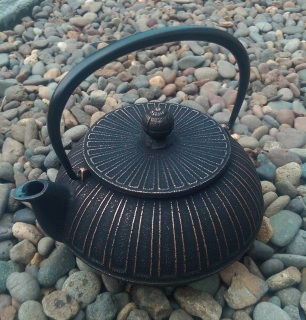 This Tetsubin cast iron teapot includes a fitted fine mesh tea strainer basket and a porcelain enamel coated interior. Watch your husband's jaw drop when he opens his sixth anniversary gift from you. Care instructions will be included with every Tetsubin. I was really surprised at the substantial weight of this striking and modern design. Beautifully crafted with uniform, raised waves ringing the coal black body and lid, just amazing. This cast iron teapot includes a fitted fine mesh tea strainer basket and a porcelain enamel coated interior. It makes a show-stopping iron anniversary gift! Care instructions will be included with every Tetsubin. Rich gold hobnails are lightly washed in deepest black for an elegant and delightful design. 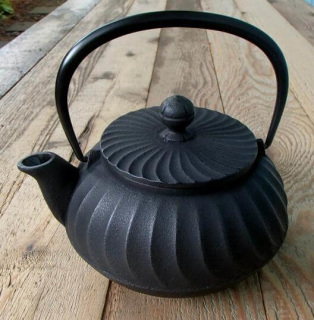 This cast iron teapot includes a fitted fine mesh tea strainer basket and a porcelain enamel coated interior. Certainly a memorable gift! Care instructions will be included with every Tetsubin. 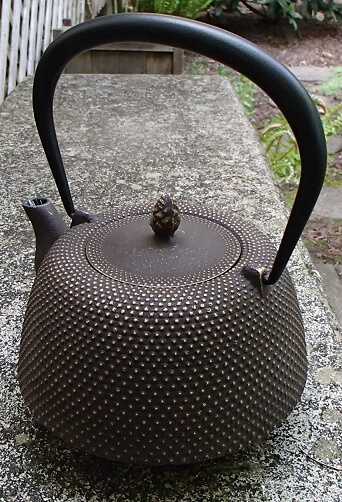 Gold hobnails are just barely visible peeking through the ethereal linen white wash that covers the exterior of this Japanese Tetsubin teapot. This cast iron teapot includes a fitted fine mesh tea strainer basket and a porcelain enamel coated interior. Ideal for wedding and sixth anniversary gift giving! Care instructions will be included with every Tetsubin. 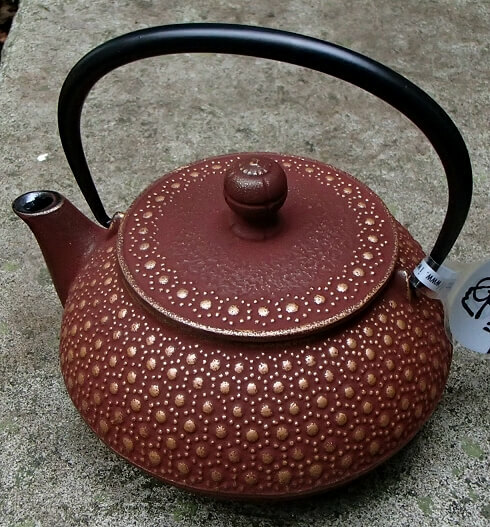 An elegant, delightful Japanese Tetsubin teapot with raised honeycomb design in gold peeking through the deep, dark red wash that covers the entire exterior. 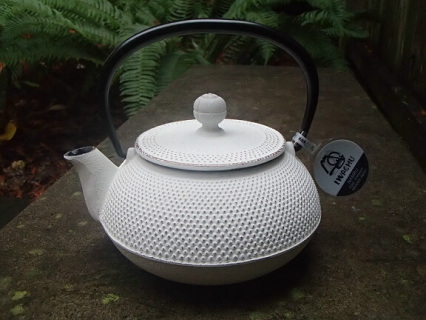 This cast iron teapot includes a fitted fine mesh tea strainer basket and a porcelain enamel coated interior. Perfect for a sixth wedding anniversary! Care instructions will be included with every Tetsubin. 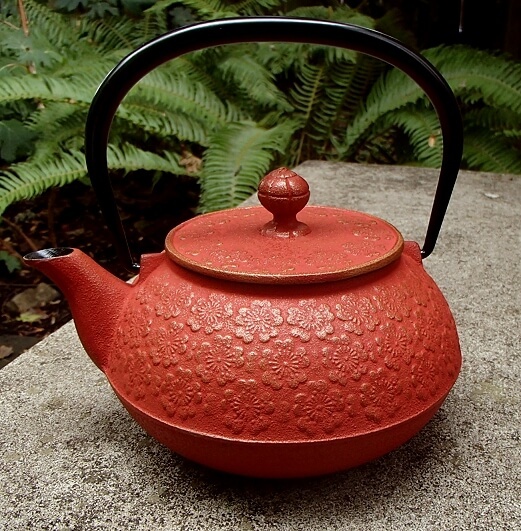 Raised golden cherry blossoms embellish this cheerful, tomato red teapot giving it a rich, golden glow. The very useful size and stunning design will cheer any tea enthusiast. 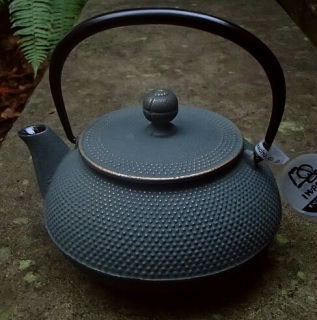 This cast iron teapot includes a fitted fine mesh tea strainer basket and a porcelain enamel coated interior. The perfect gift for any tea enthusiast, especially for the sixth wedding anniversary. Care instructions will be included with every Tetsubin. 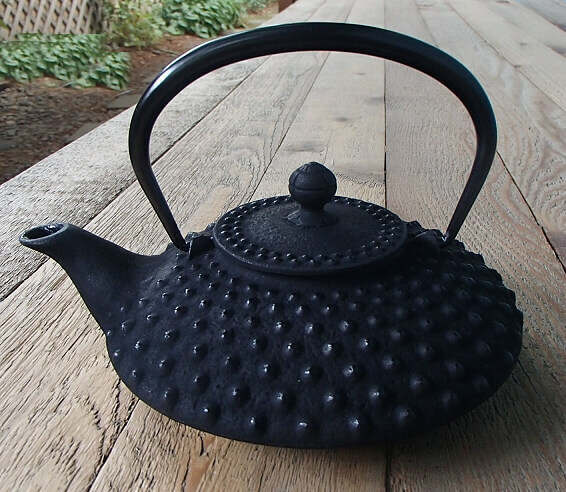 A classic Japanese Tetsubin cast iron teapot design with a unique and mysterious color twist. Gold hobnails peek through the blue-green-gray wash that coats the exterior. It makes me think of roiling seas and winter storms. 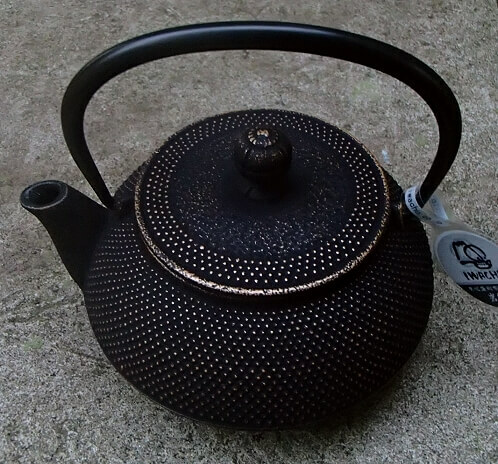 This cast iron teapot includes a fitted fine mesh tea strainer basket and a porcelain enamel coated interior. A unique and elegant tea gift! Care instructions will be included with every Tetsubin. 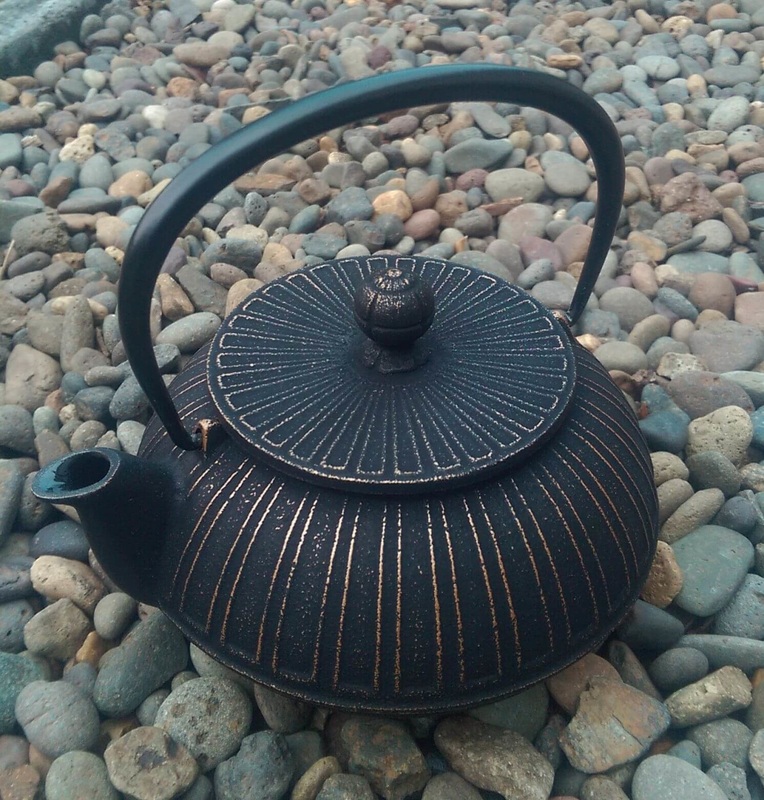 This supremely elegant, dome shaped teapot has loads of gorgeous bronzed hobnails highlighted with an antique cocoa brown wash of color.. The hobnails positively glow giving this Tetsubin the extra "Wow!" factor. I love this design so much, I added one to my personal collection immediately. This cast iron teapot includes a fitted fine mesh tea strainer basket and a porcelain enamel coated interior. 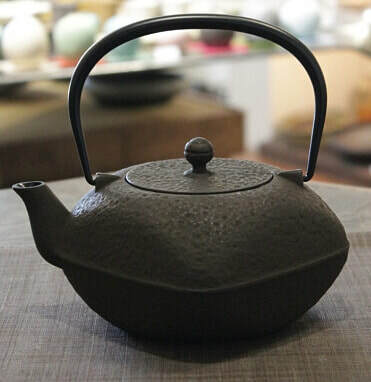 A stunning tea gift, especially the iron anniversary!​ Care instructions will be included with every Tetsubin.